If you’re in the process of having a home built or are planning a remodeling project, countertops may have been something that’s crossed your mind. While there are many popular countertop options, you may not have considered concrete as one of them. When people think about concrete, they typically picture outdoor areas such as driveways and pool decks. And when people dream of new countertops, their minds drift to granite. Concrete shouldn’t be underestimated though. Concrete is a durable and affordable material that is used in a number of ways in and around homes today. Consider implementing it for your next project involving countertops. Below are some of the reasons why it can serve as a great alternative to traditional granite countertops. There are so many benefits to concrete that make it ideal as a countertops material, especially in kitchens. Concrete countertops are stain and heat resistant. Imagine not having to worry about accidentally staining your new countertops with food, or placing a hot pot or pan on them. The same goes for concrete countertops in a bathroom — no more worries about makeup that may stain, or hot styling tools that are used on a daily basis. At Creative Concrete Solutions, we offer two different types of concrete countertops. Choose between a cast concrete countertop or a concrete overlay. A cast concrete countertop is made from cement and internal reinforcements such as structural steel, strong fibers, or another material that will hold the slab together. With an overlay, a concrete mixture will be placed over your existing tile or laminate countertops, which is the more cost effective option of the two. With the overlay option, you won’t have to do a complete removal of your existing countertops, like you would for a granite countertop installation. 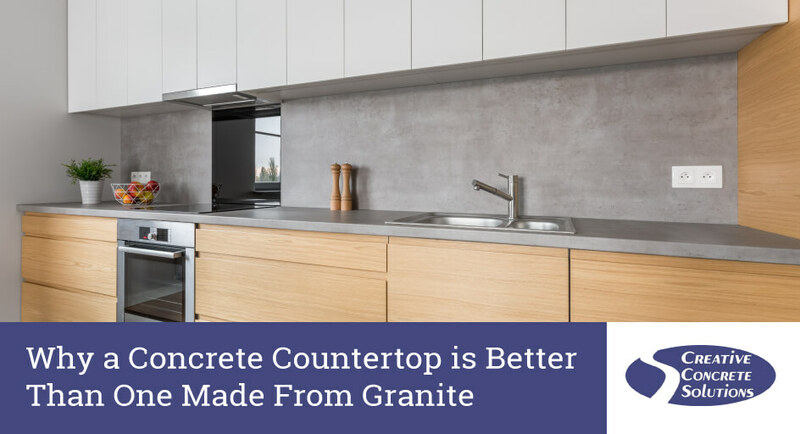 Concrete is an affordable material for countertops. It can be designed to replicate the look of granite and other natural stones. You’ll get a cost effective design that’s one-of-a-kind. No matter whether you choose a cast concrete countertop or the less expensive overlay, you’ll get the same stain and heat resistant benefits of concrete. While you may have been dreaming about granite countertops, as many do, concrete is an amazing material that can look just like granite for a fraction of the cost. As mentioned above, it’s a forgiving material that can be made to go with any kitchen or bathroom’s style. If you give concrete a chance you won’t be disappointed with the way it looks and performs inside of your home. This isn’t your average concrete, after all. If you’ve decided to install concrete countertops in your home or would like to learn more about how concrete’s a great alternative to granite, reach out the Creative Concrete Solutions in Eagleville, TN. Call us today at 615-691-6613.